Home 3rd year anniversary celebration company Company Blog company story Office office anniversary office tenure officemates red red company Third Year Anniversary My 3rd Year Anniversary in our Company! 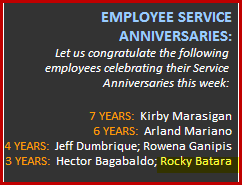 My 3rd Year Anniversary in our Company! What more did my company brought into my life for the past three years?! I'm starting to build new careers and opportunities...! new opportunities that truly developed not only my career but also my skills and personality! 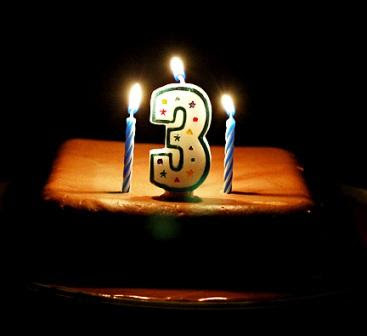 For these three solid years, we also had three managers! For these three great years, I already involved in three different teams! For these three challenging years, I transferred in three workstations! And for these three lovely years, I fell inlove with my three officemates! August 2012 - "Reaching Farther!" "Dumpsite" - The 'Dynamite' Parody! The Girl Who Made Lady Gaga Cry! A Lucky Chinese Bamboo Plant! At Home With Our New Employee Lounge! My First Google Payment for My Blog Ads! What is Your Chinese Horoscope Sign?! Kung Hei Fat Choi 2011! February 2011 - "The Red Month!"